2019 tour is ONLY 3 more seats left!! Have you ever heard about "JAPOW"? Japan + powder = JAPOW!. Like you, all enthusiastic powder people is chasing deep, cold powder every year. If there is guaranteed deep snow, would you go there? Maybe... How about as well as deep powder, beautiful deciduous tree forest, delicious food, tasty sake, bullet train, old temples, snow monkeys, hot springs, kind people, clean city and more are all in there, would you go? Who would say "NO"!! Japan is one of the deepest snow country in the world with 2000 + years of history. Lots visitors visit for just only culture & history but you can have both, powder and culture!! ONSIGHT CANADA INC. is running tour to Japan since 2012-13 season. In 2019, ONSIGHT CANADA will team up with Martin Lefebvre of MTN Guiding. We are going to run the Onsen Ryokan road trip tour which is totally new concept and is going to be a classic. You will be shocked how many people is hunting Japanese powder from every where in the world. It is getting not easy to find good quality powder without big effort especially near ski hill. We are NOT GOING TO USE ANY CHAIR LIFTs during our tour. Only the people who knows what they do be able to do this. Yes your guide is certified / reliable / have local knowledge. You should expect lots vertical gain using your legs but it is totally worth. You would love your life immersing your body in a onsen (hot springs) after big day. This tour is going to become a classic. After meeting in Hakuba, we will relocate to at least one traditional Japanese Ryokan (a style of very authentic Japanese accommodation with volcanic hot spring baths). Where we go depends on conditions, but each of the possible venues is in the mountains, off the beaten path, and has very good ski touring from the door. To be clear, this is a road trip, and you will stay at different locations away from the growing Hakuba crowds. The unique highlights include: amazing terrain, pure Japanese cuisine, classic Japanese accommodation and of course, the hot springs (onsen). This will all be served by professional backcountry ski guides with a special focus on providing a fully hosted service for people who value the experience. * You will need to be in Hakuba on the afternoon of the 21th for a pre-tour meeting. The tour will conclude in Matsumoto on the early afternoon of the 28th. - air ticket to / from Hakuba, Japan before / after the tour. Yuji came over to Canada from downtown Tokyo, Japan in 2002. He planed to stay in Canada for only one year to check out the mountains but he’s still here. Seems he was trapped in Canadian deep pow and can’t get out! 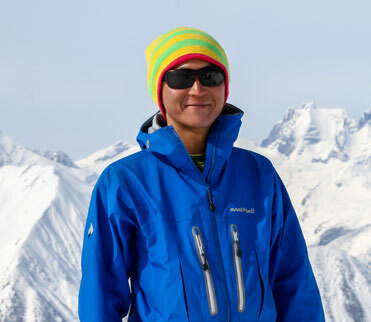 Yuji is a certified ACMG Ski Guide and Canadian Avalanche Association Professional Member. Yuji spends most of his winter with Chatte Creek Cat skiing. When you don’t see him at Chatter creek, he’s likely guiding ski touring in the Rockies or Japan. Yuji spends the summer months guiding Japanese hikers and backpackers in Rockies. He lives year round in Canmore with his wife and two daughters. Martin grew up in Montreal and leaned to ski in the rolling hills of the Laurentians just north of the city. Like many other transplants to this side of the country Martin was lured by the call of bigger mountains and deeper snow. After a few ski bum seasons he starting working in the ski industry and never looked back. His passion for ski mountaineering has taken him all over the world in search of classic and first descents. * Itinerary is tentative. It will be varied depends on snow condition. This tour is open to anyone who has had at least a few days previous experience using ski touring equipment. You will have to be an upper intermediate or advanced skier/rider. You should be capable of climbing at least 1000m a day for at least 5 full days. This is a little more demanding than you might anticipate. Blisters can be a problem in new boots or with unseasoned feet. This tour is open to both skiers and snowboarders. Snowboarders must use splitboards. For skiers, narrow 3-pin telemark setups are not suitable - this tour has a definite powder freeride theme. A detailed gear list will be provided on booking. All participants MUST carry their own mountain rescue insurance which covers backcountry skiing activities. You must be insured for helicopter costs, medical care, and repatriation to your home country. You will be asked to provide proof of your policy before joining the tour. A 500 CAD deposit is required to secure a spot on the trip. Full payment is required by October 21th, 2018, after which cancellation will incur a loss of 500 CAD. As always, we will endeavour to fill your spot if you do cancel, and if successful, we will provide a 100% refund minus any transaction costs. Travel insurance with a cancellation clause is highly recommended.